Now analyzing the relationship between friends isn’t my job as a social media writer and analyst (I leave that to the shrinks), but looking at how businesses and their ‘friends’ interact is my business. Here are a few pointers to follow if you don’t want to make your fans turn your business into a cat photo, or cause them to jump up and down maniacally on their bed. This commonly comes in the form of asking questions of your fans that are there in an effort to get comments and interaction, but which fail miserably and come across as, well, trying too hard. Yes, you need to have an engaged and active Facebook following, but you really don’t need to look desperate! For example, let’s say that it’s National Dog Day, as it was when I wrote this, but you put up something for your curtain company asking for your fan’s favorite dog breed. There just isn’t any relation to your curtains and the post, except for the fact you’re trying too hard. 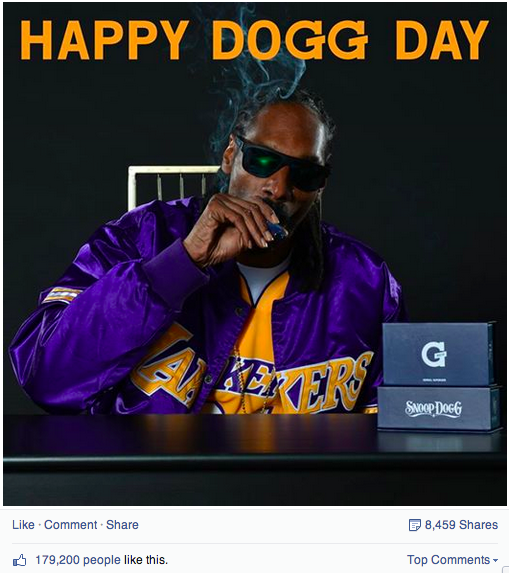 Now if you’re Snoop Dogg and it’s National Dog Day, you post away. Even better, a big picture of dogs partying, complete with party hats, will truly help your dog related company strike up some shares and comments – think dog food manufacturers, pounds, shelters, kennels, and vets. If you really, REALLY, have to get in on the action, be sure to find an angle that works. You may not be related to National Dog Day, but a picture of the owner or CEO with his dog could work as long as you clearly talk about what’s going on. Facebook allows you to tag your followers in your updates. This can be a way to engage with your fans in a very direct way. It can also be a way to completely creep someone out if you do it wrong. You have to save your tagging for moments when it is truly relevant to the person being tagged. Never do it just to try and expand your reach or boost engagement via publicly calling on people. You’re a business, not a friend. Anything you do that puts people out in the public that they don’t want is a way to make them feel that their privacy is being invaded. Think of Facebook as like any other conversation. You wouldn’t yell someone’s name across a crowded room who you don’t know. Doing so on Facebook can be incredibly annoying and smack of commercialism. With this in mind, you can’t show up, drop your marketing message, and then walk away. In fact, that’s not what you want to do at all – you want to increase engagement with your fans and better your EdgeRank, or whatever they’re calling it now. If one of your fans takes a moment to write you publicly, you had better take the time to respond. Not only will ignoring the fan in question cause them to feel ill will towards you, but anyone else who comes across your page will see this negligence and not want to “like” and follow your Facebook Page. You can find these posts in the “Posts to Page” section of your page. Take a look and respond to every comment. Yes, even the negative ones – unless they’re blatantly trolling. Effectively handling negative comments may be the best thing about Facebook. Users can see for themselves that you care about the happiness of your customers – something that can’t be had from private phone conversations. If you start getting more posts than you can deal with, good! Hire a Facebook page manager. You’d hire someone to answer your phones if you couldn’t handle it anymore, right? Treat your Facebook business page accordingly! Did you notice a trend there? Only one post did anything in the way of trying to increase engagement, the rest were all about them. I’d stop following them if their enchiladas weren’t so darn tasty! Take a look at the accounts on your personal Facebook page. The friends that you’re the most interested in – do they only post things about themselves, or do they share interesting videos, articles, and songs that are not their own? If your friends are anything like mine, they post interesting content from others that I look forward to seeing. There is an unlimited source of material out there to share on your Facebook business page – it is called The Internet. Look at what your fans respond to over time, share more content in that theme, and work your own content in periodically to keep your brand message alive. This article was written by Matthew Yeoman from Business2Community and was legally licensed through the NewsCred publisher network. Previous articleInterview With Hidden City Startup Founder: Is He Naive or an Innovator?